Sugarhouse is unrecognizable to those of us who hung out there in the ’90s and early 2000s. The funky, bohemian neighborhood with coffee shops, record stores and used book stores where I started reading SLUG Magazine are long gone. In their place, trendy restaurants, shops and condos fill the streets. While this gentrification is hard to swallow, there have been huge improvements to the culinary landscape. One of those improvements is The Annex, a gastro-pub by Epic Brewery, which opened a few years ago. 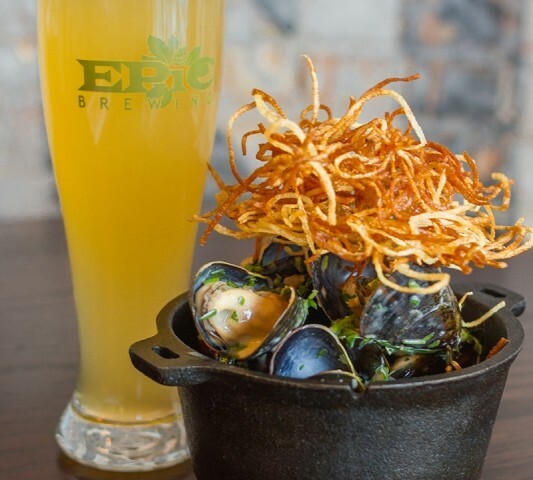 Serving every single beer brewed by Epic alongside a menu of intriguing dishes, the restaurant, surprisingly, received so-so reviews. The imagination was there, but something was missing in the execution, leaving diners underwhelmed. 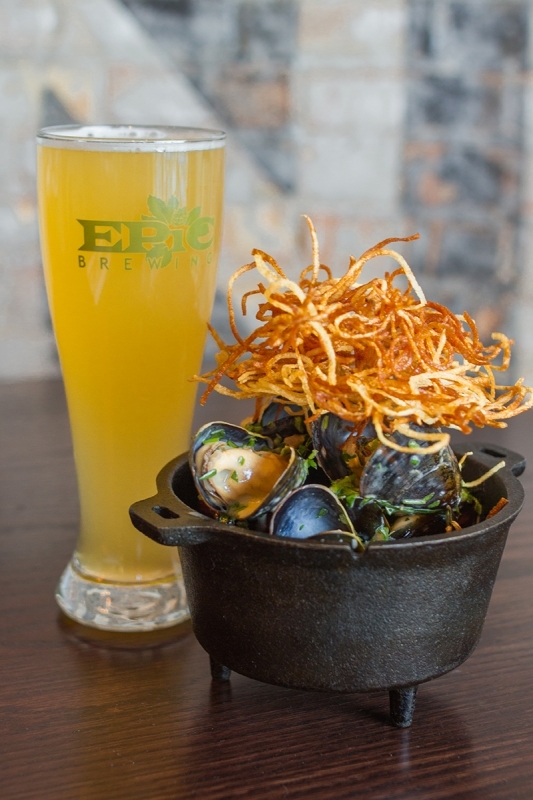 The arrival of Chef Craig Gerome from San Francisco this year, however, has rocked this gastropub. The Annex is now more like a fancy restaurant with lots of great beer. Selecting from the 39-plus beer options is the most challenging (and fun!) part of your meal at The Annex. Beers are organized in Classics (think basic, good beer like Spiral Jetty IPA), Elevated (fancier beers that show off their talent, like the deliciously dark 825 State Stout) and Exponential (for true beer enthusiasts, like the Double Skull Doppelbock, a rich and filling beer). Prices range from $1 for a taste, $5–$7 for a pint, and $7–$12 for a 22-oz. bottle. Your server is more than happy to suggest pairings with your meal, but don’t be afraid to experiment—you can try up to two samples at a time. My favorite beers are those that have been aged in barrels. Both Brainless on Peaches and Brainless on Raspberries are delicious, made with real fruit and aged in French Chardonnay casks, giving them a taste reminiscent of wine. If you don’t want fruit in your beer, you can’t go wrong with the Big Bad Baptist, with notes of vanilla and coffee aged in a whisky barrel. Another beer you can’t miss is the Smoked & Oaked Belgian: It tastes of smoke and whisky. The Annex is an ideal weekend brunch spot. Order a Beermosa ($4), a cheery combination of fruity beer and orange juice. Not as cloyingly sweet (and boring) as a mimosa, and more refreshing than a bloody Mary, Beermosas are a delightful option to pair with The Annex’s brunch dishes. The Pastrami-cured Salmon ($9) is more like a painting than an entrée, with vibrant peach petals of salmon, pink pickled radish, dabs of crème fraîche and a layer of bright-green pea shoots decorating the plate with three slices of housemade lavash bread. Each bite was heavenly—the salmon was peppery and flavorful, complemented by the mellow crème fraîche, tart pickled veggies and fresh-tasting pea shoots. A more hearty brunch option is the Maple-Brined Ham Biscuit ($10) with layers of melt-in-your-mouth, sweet ham from Christiansen’s Farm, tangy Beehive Cheddar Cheese and a fried egg between two scrumptious homemade biscuits. Served with breakfast potatoes, it’s a filling dish, perfect to nurse a hangover or begin a busy day. Moving on to lunch and dinner, there are many delicious options for appetizers and small plates. The Deviled Eggs ($4) are a tasty way to begin a meal. Hardboiled eggs have never been so tempting—each half is filled with a velvety yolk mixture and topped with fresh tarragon and smoked paprika. These are not Grandma’s deviled eggs—they are fresh and bursting with flavor. The most impressive small plate I’ve enjoyed is the Steamed Mussels ($9 for a half order, $17 for a full order). Bouchot mussels are grown on a rope, resulting in more tender meat and less grit. Not fishy at all, the mussels are briny like the ocean. The presentation is alluring—a layer of thin, crunchy, golden fried potatoes top the dish. Steamed with beer, butter and parsley, the flavor is out of this world. I could not keep my fork away from my husband’s entrée, The Bavette Steak ($18): Thick steak fries topped with slices of tender, medium-rare steak dressed in a rich Bordelaise sauce (a traditional French sauce made from butter, bone marrow, shallots and dry red wine) proved irresistible. Each stolen bite was rich and dreamy. The Annex does meat well, but their vegetable dishes are also on point. While not currently on the menu, last winter I tried the Chickpea Fries. Made from chickpea flour, the fries are more like strips of dense polenta served with sautéed carrots, figs and yams. The sweetness of the figs and yams were unexpected and made the dish luscious. During that same meal, I enjoyed vibrantly flavored Brussels sprouts dressed with lemon, garlic, capers and parsley. I’ve eaten Brussels sprouts all over this town, and these were the best. If they’re on the menu, be sure to order them. Dessert options change from time to time. Definitely order the donuts— the little orbs of fried dough served warm with a dipping sauce are a perfect note on whcih to end a meal. I’ve had the Lemon Zested Doughnuts ($6), which are dipped in a raspberry purée and were delectable. I’ve heard rumors of other flavors, and I’m sure they’re just as good. The food is top notch, but there are more things to enjoy about The Annex. The service is excellent—each server I’ve had is friendly and knowledgeable about the food and beer. The restaurant itself is spacious and inviting with exposed brick walls, twinkly Christmas-light accents and high ceilings. It’s a pleasure to dine here—The Annex is the whole package. Mon. – Tue., 4 p.m. – 10 p.m.
Wed. – Thu., 11 a.m. – 10 p.m. Sun., 10 a.m. – 10 p.m.